Lyz Jaakola (Mezzo Soprano) is an Anishinaabe musician and educator enrolled with the Fond du Lac Band of Lake Superior Ojibwe. Lyz balances singing in many styles and educating about Native American music internationally amidst her teaching schedule at Fond du Lac Tribal and Community College. Lyz first sang in the early 90s with N.O.T.E., Renegade Comedy Theater, Arrowhead Chorale’s G & S productions, all the way thru LOON’s Gianni Schicchi in 2011. Her bilateral arts career has been recognized with awards and recognitions including the 2009 Native American Music Award, 2012 First Peoples’ Fund Community Spirit Award, 2013 Sally Ordway Irvine Award, Arrowhead Regional Arts 2014 George Morrison Artist Award, Classical MPR’s 2013-2014 Class Notes Artist and numerous collaborations with Arrowhead Chorale, Echoes of Peace Choir, KBEM jazz radio, and others across Minnesota. 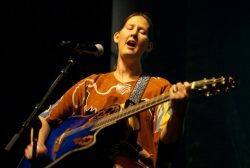 Lyz has recorded 6 CDs, had her music in local film, video and television, including the Emmy-awarded PBS documentary, “Waasa Inaabidaa”, mentored Native youth in music composition, and published children’s literature. This is all because she has a supportive, loving husband and family with three beautiful children, all from her little home on the Rez. Miigwech Manidoo!